The more I tried to make sure Toby was warm enough while we don’t have heat, the more he fought my initiatives. With the temperature dipping down to 38 degrees last night, we went and bought some ceramic electric heaters, which makes me nervous, but certainly heated up the house. And, in case you’re wondering … no, I didn’t decorate my house to match my dog’s colors. It kind of just happened 😉 Happy Monday! Next Post Can You Work From Home All the Time? You better stay wrapped up and warm! you need hot laundry (hot tub) to lay in! lol!!! everyone teases me because our decor matches Dakota and it was an accident too! Actually I think our dogs are subliminal suggestions for us. Isn't it funny how when something like a heater or air conditioner breaks we don't worry about ourselves at all, it is our babies we worry about!!! Toby is sooo lucky to have you! 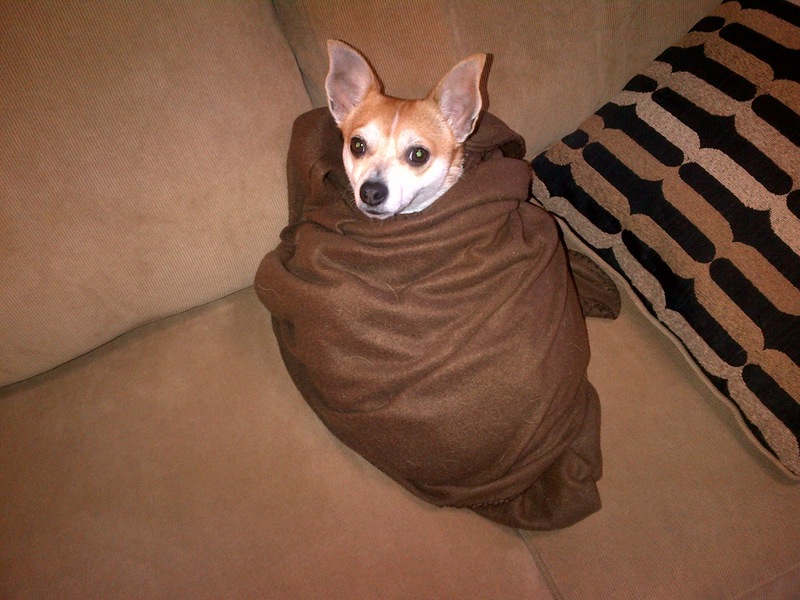 Aw, hope Toby is staying warm! Too funny about the decorating… maybe we do it unconsciously to keep all the hair from showing so much! However, the tumbleweeds of hair that roll across my hardwood floor give it away anyway. Ha! I have hardwood floors, too, and have that same problem. I've tried a ton of different products to quickly clean the dog hair, but haven't really like any of them. What do you use? Our house matches our chihuahua too. Although we decorated it before we got him! He doesn't seem to be resisting that much. He looks totally pampered! And loving it!